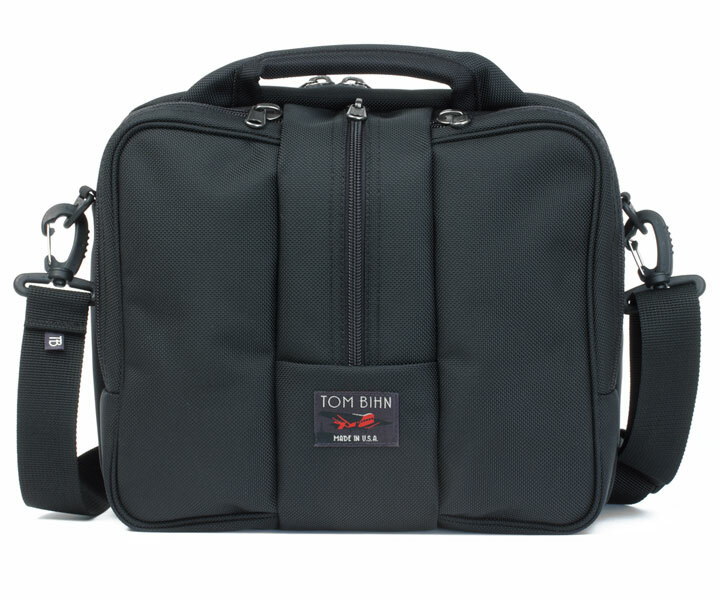 The Tom Bihn Co-Pilot: A great personal carry-on item, and a great EDC shoulder bag. 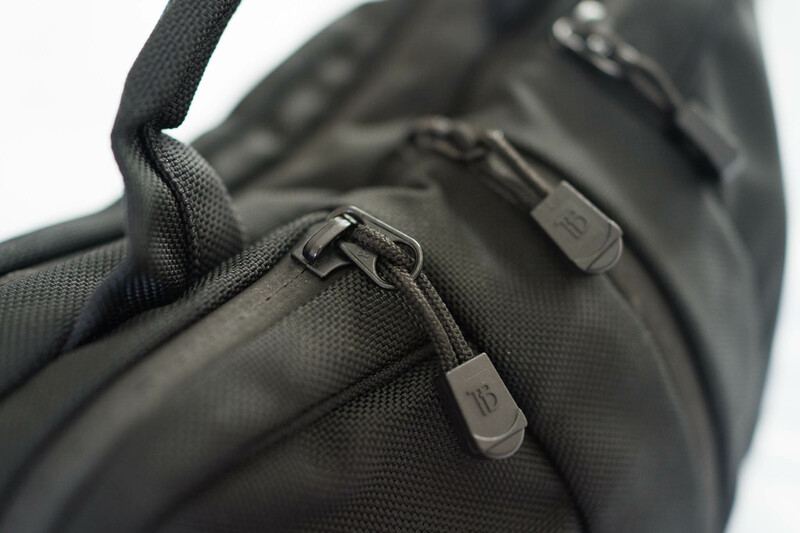 Tom Bihn describes their Co-Pilot shoulder bag as a small, personal carry-on for the essentials. That description is what initially drew me to the bag. I wanted a small secondary bag that could serve as a personal item to my main carry-on bag during flights. 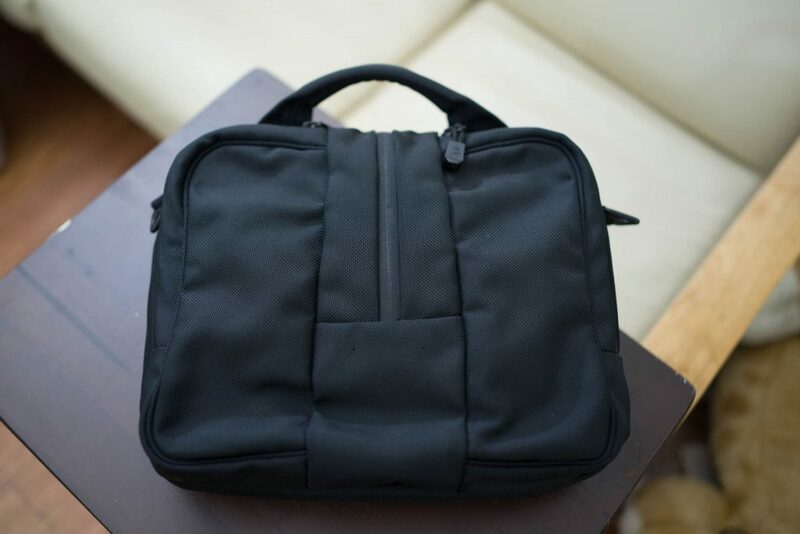 While it works amazingly well for that, I’ve also found this bag to be an even better everyday carry (EDC) briefcase. 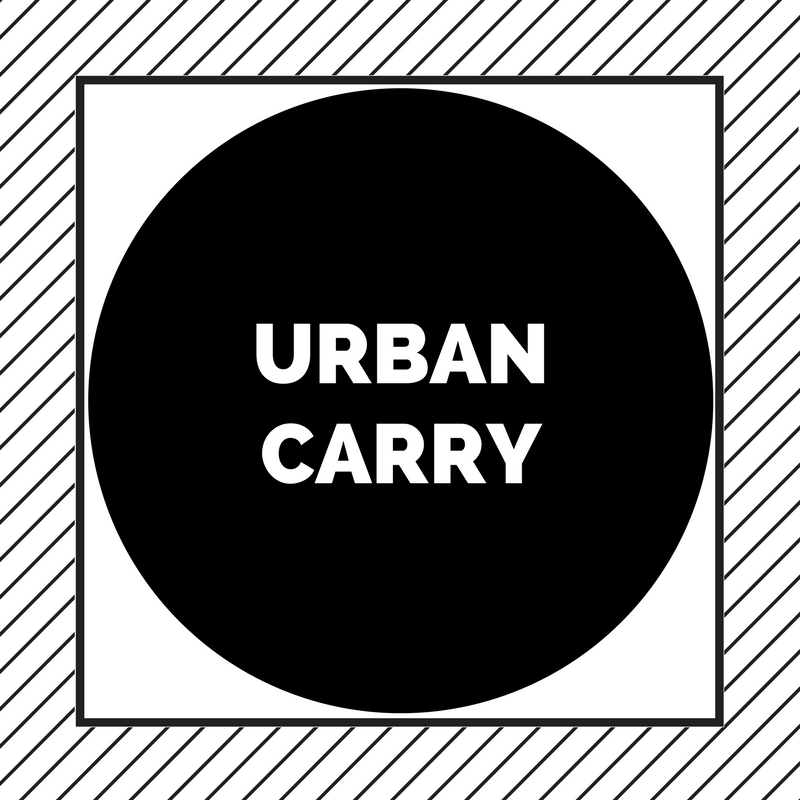 I’ve taken this bag as a secondary carry-on (under seat flight bag) all over the world over the past 4 or so years, but this review will focus on how I have used it as an EDC shoulder bag and briefcase. One important thing before we get into the review – the Co-Pilot is not big enough to carry a 13″ laptop. So if you need a bag for a 13″ laptop, you will need to step-up to the larger Tom Bihn Pilot bag, which is essentially the same design (same number of compartments etc..) as the Co-Pilot, but is much wider and slightly taller to be able to accomodate a 13″ laptop. 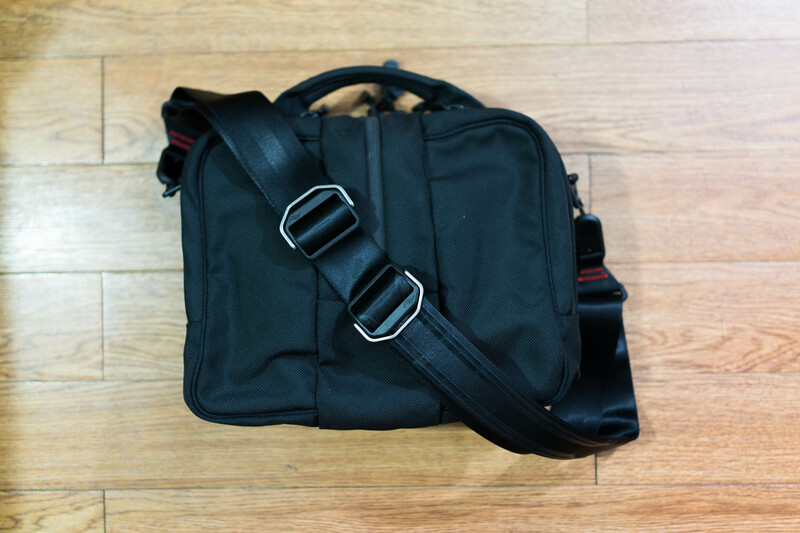 If all you carry is an iPad or a 12″ Macbook then the Co-Pilot will be able to fit those in just fine. 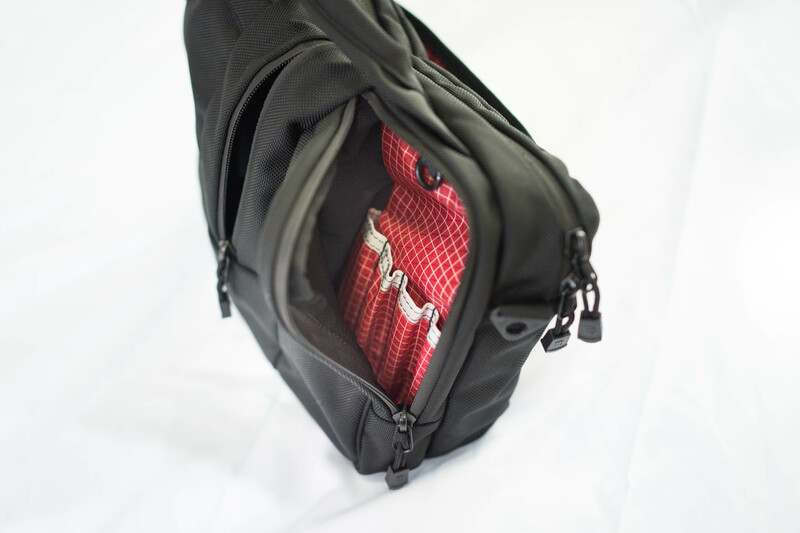 I ordered my Co-Pilot in black 1050d ballistic nylon, with a red dyneema interior. You’re able to pick the interior color from a variety of brightly colored dyneema fabric, this is great because dyneema is a fairly light fabric, so it won’t add unnecessary bulk to the bag, and the bright colors help you see the contents of your bag. All zips on the bag are #8 YKK splash proof zippers, which is a perfect choice for an EDC/travel bag this size. 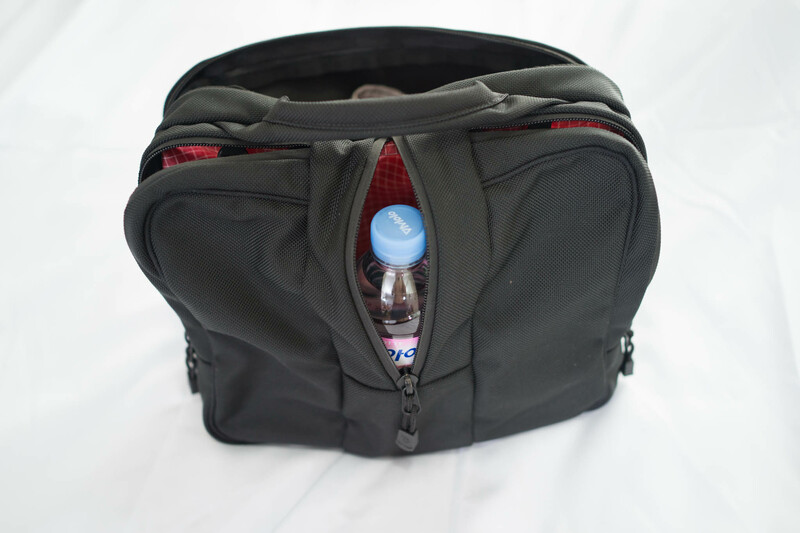 From the top: The main compartment, and the three front compartment pockets. The main compartment has two cargo pockets in ultralight dyneema fabric. From the front, the bag has three zipped front pockets, a large zipped main compartment in the middle, and a cargo slip pocket on the back that also doubles as a luggage pass-through. There is also a very nice carry handle right smack in the middle of the bag. Inside the main compartment are two large cargo pouches. There are three O-rings inside the main pocket and one each on the left and right pockets, although I don’t personally use them. 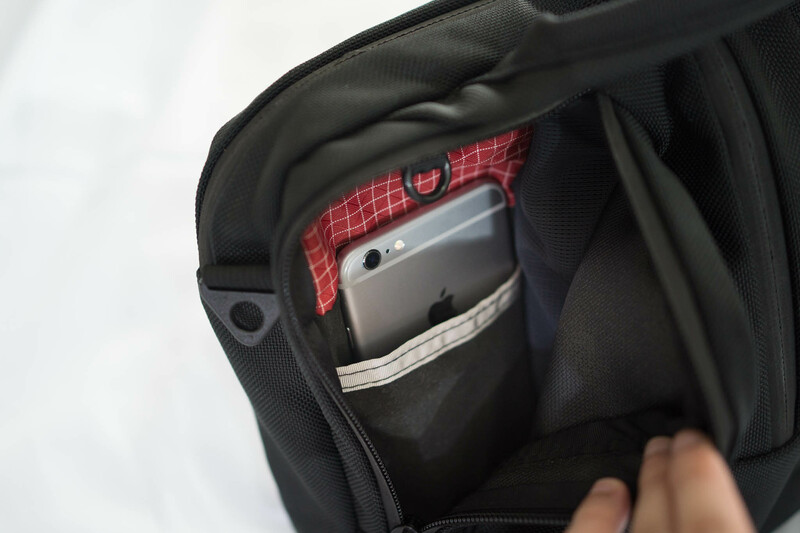 The left front pocket includes a pouch for a cellphone and the right front pocket includes slots for pens. The middle pocket is designed to carry a water bottle, travel mug or an umbrella, and has no internal pockets or slots. 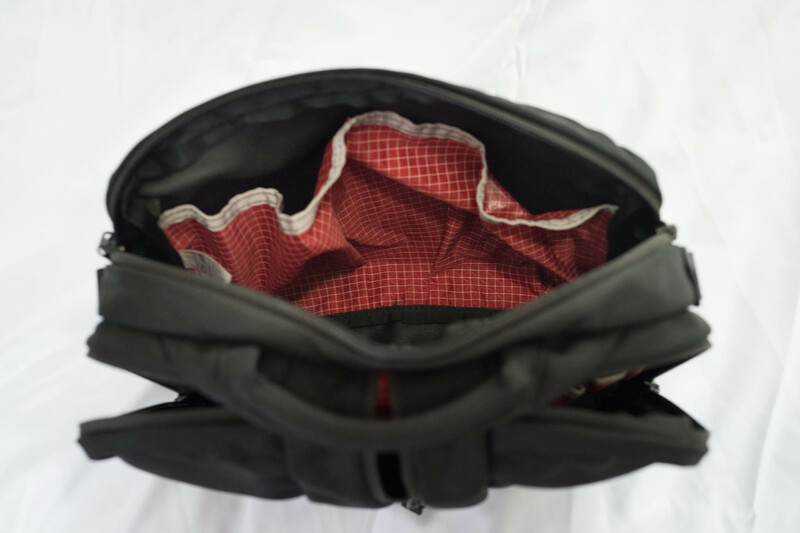 There is a grommet on the bottom of the middle pocket to help drain any accidental spills. The left front compartment with an internal slip pouch. Great for passports, wallets or phones. Here, I’ve got my iPhone 6s plus. 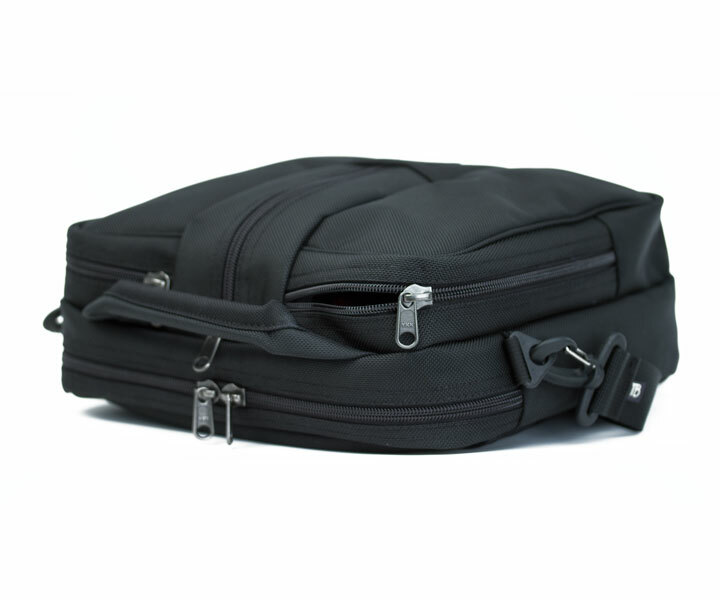 The back slip pocket is an open easy-access pocket with a horizontal zip on the bottom that when unzipped allows you to slide the bag through the handles of a roller bag. Unfortunately, this means that you won’t really be able to use the pocket for small items of valuable items while using it as a luggage pass through at the same time. I’m okay putting a magazine in there, but I won’t trust this pocket to hold my passport if I’m also using it as a luggage pass through for example. I would have preferred if Tom Bihn had added a dedicated luggage pass through slot, in addition to the slip pocket. The front right compartment has a small admin panel. The three front pockets are really what make this bag unique, they are also larger than they first seem. I’ve always been surprised by the amount of stuff I can squeeze in the front pockets. I’ve succesfully used the Co-Pilot as an overnight bag for summer travel, sans a laptop and shoes of course. If you’re a light packer, and don’t need to pack jeans or other bulky clothing, this bag can work as an overnight bag for summer travel. The front middle compartment can easily swallow most water bottles or travel mugs. Any of the front pockets can swallow either of my 2 cameras (a Sony RX1 and Sony RX100 V) and still have room for more. 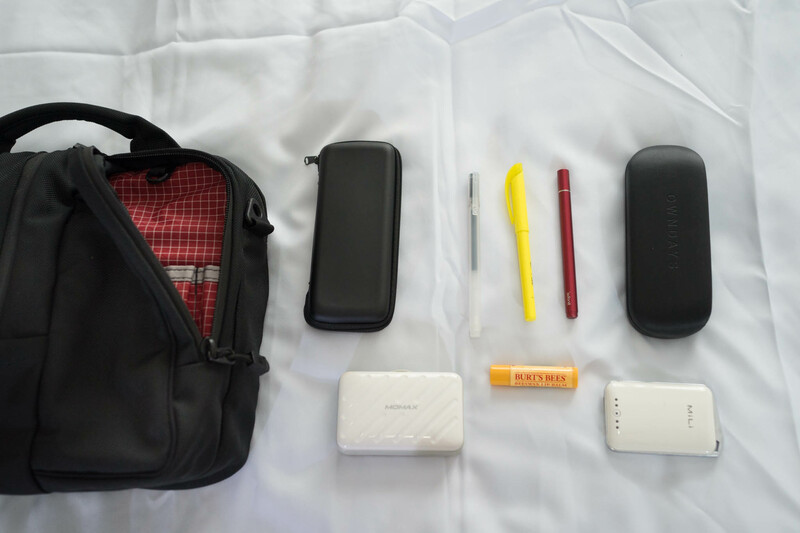 I typically stick a camera in the middle and left pockets, while my phone and wallet go in the right pocket and I’ve still got a ton of space for a powerbank, plus a pouch containing the 8 batteries shared between my 2 cameras. This bag is the perfect size for cramped spaces, like a crowded subway, where you don’t have much elbow room. The separate compartments also mean that you don’t need to go digging around one big compartment in front of everyone. Glasses, pens, power banks, all this can fit in one of the front pockets, and still have space for more stuff! The bag comes with a regular shoulder strap that isn’t all that great. It’s only a slight step-up from your typical Kenneth Cole or no-name strap. I strongly recommend that you consider getting a different strap. Tom Bihn offers the Absolute Shoulder strap (which you can get for an additional $20) which has a large neoprene area (Op/Tech branded) for your shoulder. It’s great for heavy loads because the neoprene really stretches. It’s also great if you want a strap that doesn’t slip of your shoulders. I did get the Absolute shoulder strap with my bag, however, I only use it when I know I’m going to be schlepping heavy loads. Most days, I prefer seatbelt style straps that easily slide through clothing. I prefer wearing the bag across my shoulder and sitting on the small of my back, sort of like a messenger bag. 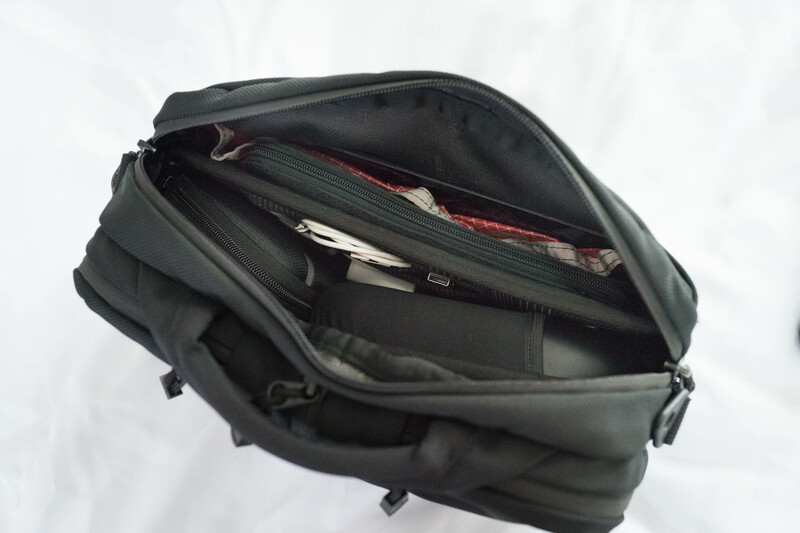 I also find the Absolute shoulder strap to be a bit too bulky and a bit of an overkill if the bag isn’t loaded up. 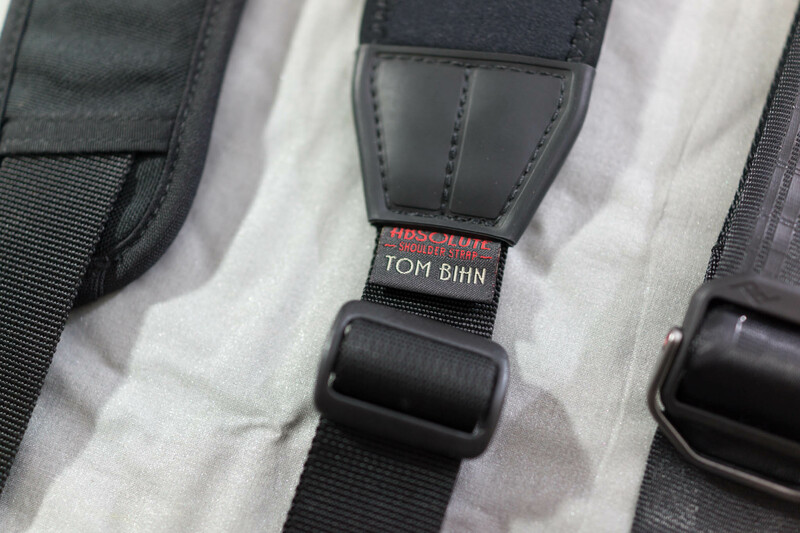 The Tom Bihn Absolute Strap: Great for heavy loads, and for carrying as a shoulder bag. But not great for cross-body carry. 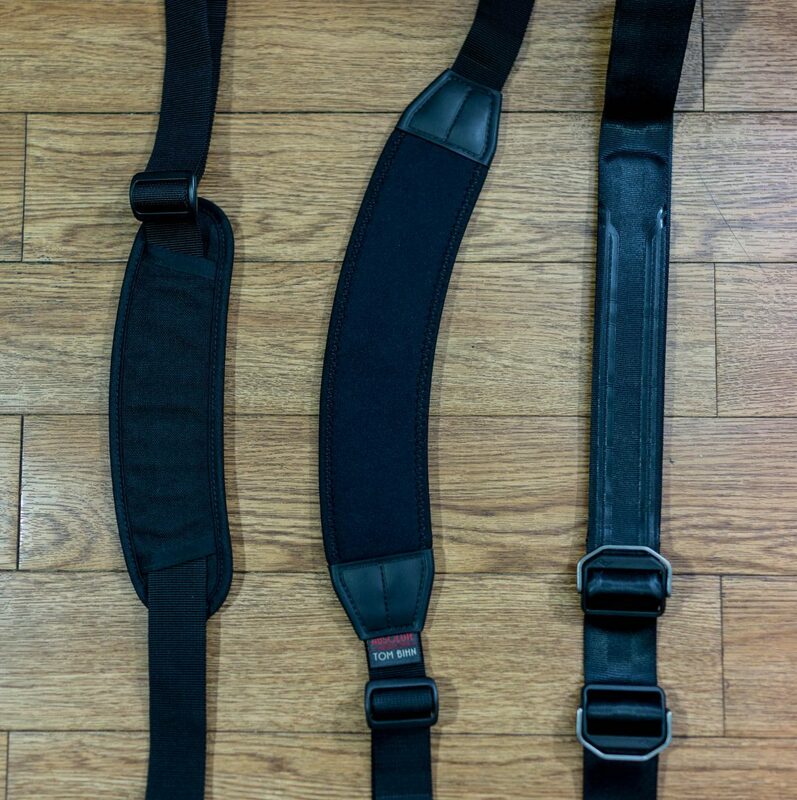 The current strap I use is this strap from a company called Peak Design. It’s actually designed to be a camera strap but I found it to be the perfect bag strap for light loads. Since it’s made of slippery seatbelt webbing, I’m able to easily slide the bag to and from my back for easy access. One side of the strap includes some grippy material, so if I need to carry it like a normal shoulder bag (and not cross-body) I just flip the strap over and use the side with the grippy material. 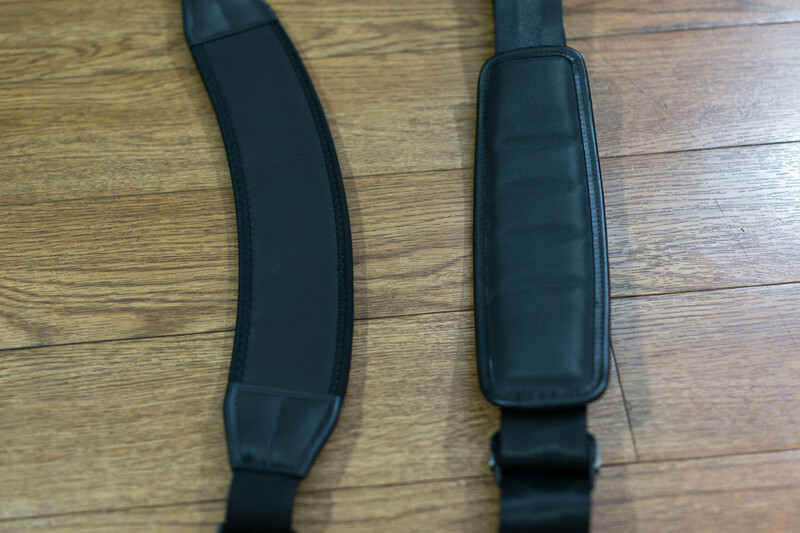 You can check the strap out here, it’s great if you want the versatility of a sliding strap and a grippy strap, although for heavy loads, the Absolute shoulder strap is the better option. Another seatbelt style strap to consider is this shoulder strap from Defy Bags, which, similar to the Absolute strap, also attaches via D-Rings. 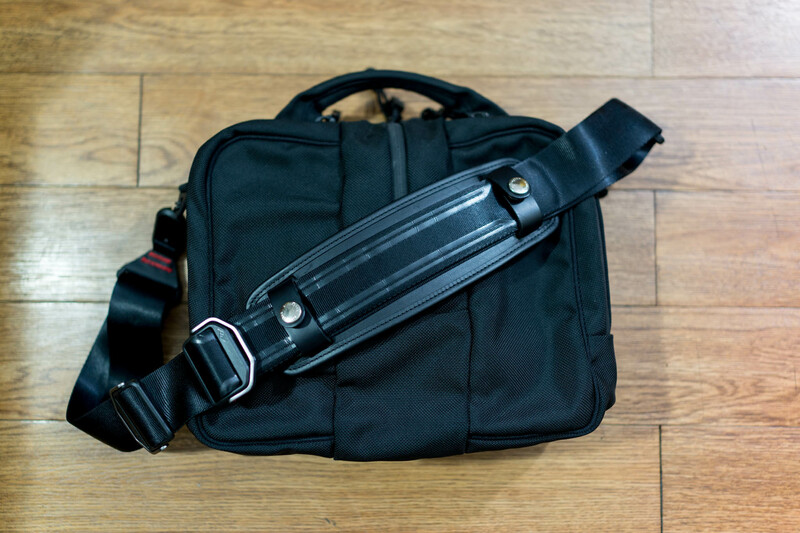 The Tom Bihn Absolute Strap with a neoprene pad and the Billingham SP50 shoulder pad attached to the Peak Design Strap. This is a well made and tough little bag. Made in the USA, if that matters to you. I’ve used mine extensively for over 4 years now, and it hardly shows any wear. The design is very low key. This isn’t a bag that draws attention. My ‘gray man’ bag. The Co-Pilot with the Tom Bihn logo removed. The eagle eyed among you will notice that my bag doesn’t have the Tom Bihn logo. There normally is a rather colorful and medium sized TB logo stitched on to the front middle pocket, but I took a box cutter and slowly took mine off. Most people probably don’t care about a little logo, but I prefer a more ‘gray man’ look and the colorful TB logo on this bag was a tad too bright for my tastes. I can honestly say I love the look more without the logo. The monochromatic and nondescript look plays well with the overall design of a bag that looks really small but can actually hold a ton of stuff. And can it hold a ton of stuff! I’ve successfully used this bag as an overnight bag as well. 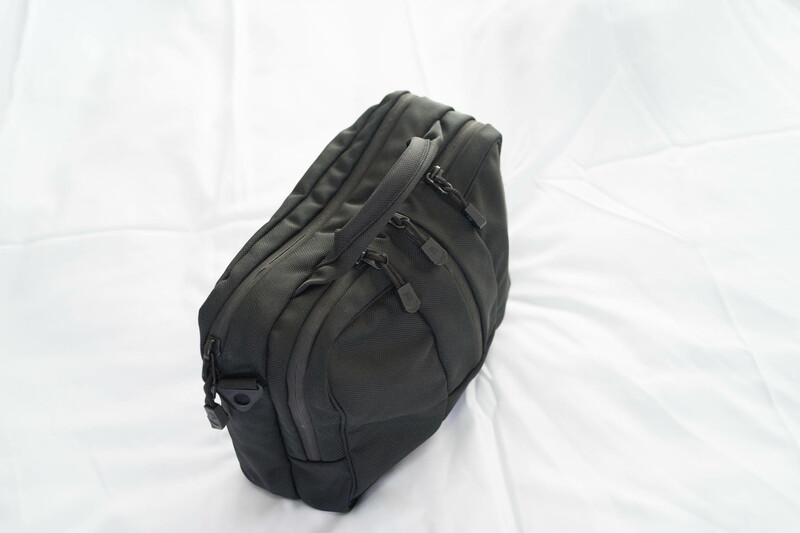 As long as I’m not carrying an extra pair of shoes, and non-bulky clothing (most of my clothing are technical fabrics, combined with wool and linen), this is the perfect size for a minimalist overnighter. Fully packed as an overnight bag. If you don’t need to carry around a 13″ laptop and are looking for a small briefcase style bag that can function as a personal item for travel, and then transition into a small day bag when you arrive at your destination AND can also function as a killer everyday carry briefcase when you’re not travelling, then the Tom Bihn Co-Pilot should be at the top of your list. Daily carry. With the Peak Design strap. With the Billingham shoulder pad installed on the Peak Design strap. With properly installed zipper pulls, you not only get longer pulls, they also go a long way in silencing the clacking sound that zippers make. Watch the video below for the correct way of installing them.